The portrait is entitled #NotABugSplat, which is a reference to the term “bugsplat,” used by drone operators to dehumanize victims of their missile strikes. Rather than seeing small, grainy figures comparable to insects on their computer screens, drone operators who happen to fly over this heavily-bombed, rural area near the border of Afghanistan will now be confronted with the image of this innocent girl looking back at them. Launched by a collective that includes Pakistanis, Americans and others involved with French artist JR’s Inside Out Project — in collaboration with Reprieve UK and the Foundation for Fundamental Rights — the artists involved hope to create a dozen more of these installations around Pakistan. While there is still much to be done, there is evidence that the mounting pressure against drones both at home and abroad is having an impact on policy. 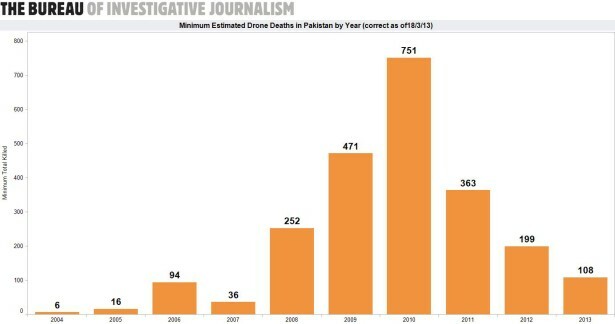 Although President Obama dramatically escalated the drone war in Pakistan over his first two years in office, the number of drone strikes and casualties peaked in 2010 and have dramatically fallen ever since. According the Bureau of Investigative Journalism, there were no confirmed civilian casualties in Pakistan in 2013 and more than 100 days have passed since the last drone strike in the country — the longest recorded pause in attacks since they began 10 years ago. And as Spencer Ackerman reported last year for Danger Room, the long boom in military spending on drones is over. To continue to build awareness around drone strikes — and the movement to end their use — a broad coalition of organizations and individuals have organized Spring Days of Action. Their website lists dozens of creative actions planned around the country as part of this coordinated campaign over April and May.